Should My Piano Be Tuned to A440? Why should I pitch raise my piano? I am asked that question almost daily as I explain to my clients what I have found upon arrival at their home, and I set up for a tuning job. It is important to understand that pitch corrections before the actual tuning is always the clients option. Let’s consider what tuning is. A simple definition is: the strings of a piano being adjusted so that when the instrument is played, the intervals such as: thirds, fifths octaves, and any other interval that is played will sound pleasing and musical to the ear. It is important to note, I did not include in the definition, the pitch of the piano. That is simply because a piano, like any stringed instrument can be tuned at any pitch that is desired. (all stringed instruments can be damaged if tuned to sharp/to much tension, or if tuned to low can sound dull and lifeless) So if all this is true, why should a piano owner have the pitch corrected on their piano? Quite simple; first, modern pianos were designed to sound their best when tuned at a pitch referred to as, standard pitch or A440. Second, if the piano is within the terms of the manufacturer’s warranty, the piano must be kept at A440 to avoid voiding the warranty. In my opinion all modern pianos should be maintained as close as possible to standard pitch…simply; they sound best when tuned to A440. When a piano is allowed to set un-tuned for a long period of time the pitch will drop. It is common to find pianos a quarter step flat, a third step flat, and in some cases as much as a whole step flat. This condition brings an option to the table. You; the piano owner must decide what you want done. The piano can be tuned a quarter step flat, or it can be tuned a whole step flat, or you may decide to have the pitch corrected and tuned to A440. Piano manufactures recommend tuning a piano every six months or more often depending on use and demand. Pianos that are tuned often require very little change in over-all tension of the piano. This one fact helps produce solid and stable tunings, and will help prevent the pitch from dropping. Pitch corrections of one half step can effect the tension on your piano by thousands of pounds. The piano structure will react to this change, making it necessary to make two or three passes through the key board to get the piano to stabilize. Pitch corrections can, and should be avoided, by tuning regularly. If your piano needs to be pitch corrected before tuning, know this: it is a common procedure and all care is taken to avoid damage to your piano during the process. Steinway says; Your Steinway has been designed and built so that in normal use and under normal conditions it should need only periodic tuning. We recommend that your technician be called at least three or four times a year. Kawai says; Due to string stretching, settling, and the effects of climate, a new piano should receive at least four tunings in the first year. After that, the type of use and the location of the piano will dictate the number of tunings required, but Kawai recommends two tunings per year as a minimum. Baldwin says; In the first year, the National Piano Manufacturers Association recommends that you have your piano tuned four times. This is a period of environmental adjustment for a new instrument, and proper attention is important. After the first year, the piano should be tuned at least twice each year, depending upon the frequency of use and atmospheric conditions. A second source of information on best times to tune, would be your piano technician. Technicians can provide a wealth of information on best times to tune that will be specific to the area of the country you live in. I service pianos in the Oakland County Michigan area, and due to our hot and humid summers, and our cold and dry winters piano owners need to have their piano tuned at least twice each year. Humidity level changes that occur in your home, or other locations will cause the soundboard of the piano to expand as it absorbs moisture, and shrink as it looses moisture. The change in the pitch of a piano can be quite dramatic in Michigan. I have found pianos can fluctuate as much as a quarter step. This fluctuation in pitch is why the piano needs tuning at certain times of the year. The humidity levels at this time of the year, (May 2011) are quite high. The piano has reacted to that change making this a perfect time to tune your piano. The humid season in south east Michigan runs from May through October. Be sure to have your piano tuned during the wet season, and then again in the dry season. Call your piano technician and schedule a tuning today. How often should I tune a piano? What time of year? A question that has come up often over my thirty years of piano service is; “what time of year is best for piano tuning in the state of Michigan?” To give the best answer to this question I must clarify a few important factors that contribute to the need to tune a piano. 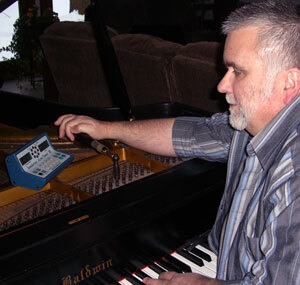 I am a piano technician serving the Oakland County Michigan area. Pianos in Michigan are affected by the changes in temperature and the changes in humidity levels. Those who own a piano in states such as Arizona, (always dry) or Louisiana, (always humid) can service their piano on a much different schedule than will be required in Michigan. Temperature and humidity level changes have a dramatic impact on the wooden structure of the piano, as well as the small wooden parts of the piano that make up what is called the action of the piano. The soundboard of the piano in many cases is made of sitka spruce. This species of wood is very much like a sponge. It will absorb moisture from the air during our hot humid summers which will cause the pitch of the piano to go sharp. The summer months are followed by our cold dry winters which will dry the soundboard. This drying effect will cause the piano to drop in pitch. In order to keep the piano in tune, you must service the piano often enough to allow very small correction in the pitch of the piano, allowing solid, and stable tuning. Another important factor in determining what time of year is best to tune your piano is; who is playing the piano, and for what is the piano used? A child playing the piano a few times each week verses a church that uses the piano for choir rehearsals, band practice, and church services will require a different tuning schedule. Added to the variety of circumstances piano owners have, are high demand piano owners, such as the recording studio. Recording studios require a finely tuned piano for their clients. Another common situation is the piano student using recorded instructional music to play along with. Many piano owners will require special care for the piano due to the individual circumstances associated with their piano. A piano technician will come in contact with people that will have different service needs for their piano. All this must be considered when determining the best time to tune. The final factor to consider is humidity control. Those that air condition the home in summer and those that humidify properly during the winter months will require less tuning, and will have greater flexibility in what months they have the piano serviced. Those that do not air condition the home and do not humidify during the winter months will require tuning more frequently, and they will need to pay more careful attention to seasonal changes. I will go into more detail on humidity control in another post, for now I will recommend that you become pro active, and control the temperature and humidity of the space your piano is located in. Now to answer the question; “what is the best time to tune in Michigan?” Piano manufacturers recommend a piano tuning every six months or as often as every three to four months if seasonal changes are having a dramatic effect on the piano. My experience with Michigan weather changes has led me to tell my in home piano clients to tune every six months. Tuning twice yearly is normally sufficient to keep the piano close to pitch and stable. It will work out that you will tune during a DRY SEASON and a WET SEASON six months later. As stated earlier, air conditioning and humidification, or lack thereof will produce scheduling issues that can best be addressed by a technician that develops a tuning track record with your piano. Recommendations will be made based on your individual circumstance and requirements. Churches, country clubs, recording studios, etc., will tune as needed. No attention can be paid to climate conditions, the show must go on, so to speak. Have the piano tuned when important events and programs are on schedule, or when artists are in studio recording. This can be weekly, or in some cases, monthly. What ever the level of demand in a professional setting, the frequency of tuning should correspond. High demand= tune often. Low demand= tune less often. If you have questions about piano tuning or piano servicing, or to schedule a piano tuning appointment please call Craig Cole PT, at 248 647-6810.